Thank you Zach for your kind words! “The team at Dynamic Designs has been crucial in helping Atilus land some of our most valued clients. Throughout the years, Atilus has worked as a behind-the scenes support and provided higher-end programming solutions when necessary. Though both companies look for web design clients, we have each found our niche in jobs together and have both been a value to each other in support and referral sharing. One of the projects that we enjoyed working on together the most was a project for Helvetia Leather. An intricate and large product database, Helvetia needed to show the purity and elegance of their leather options. Though not a full e-commerce solution, the product database went almost that far with its own “free” shopping cart for samples. 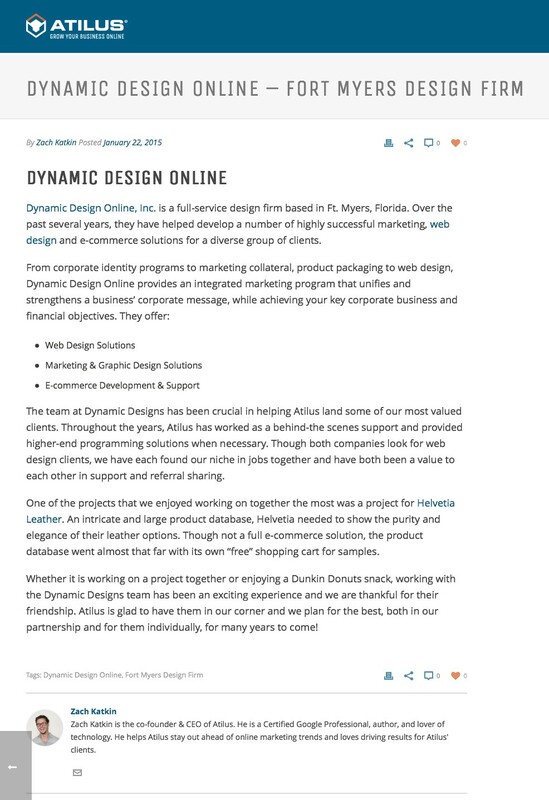 Whether it is working on a project together or enjoying a Dunkin Donuts snack, working with the Dynamic Designs team has been an exciting experience and we are thankful for their friendship. Atilus is glad to have them in our corner and we plan for the best, both in our partnership and for them individually, for many years to come!